Home Living: Is it Scriptural For Christian Husbands To Demand Their Wives to Go toWork? Is it Scriptural For Christian Husbands To Demand Their Wives to Go toWork? 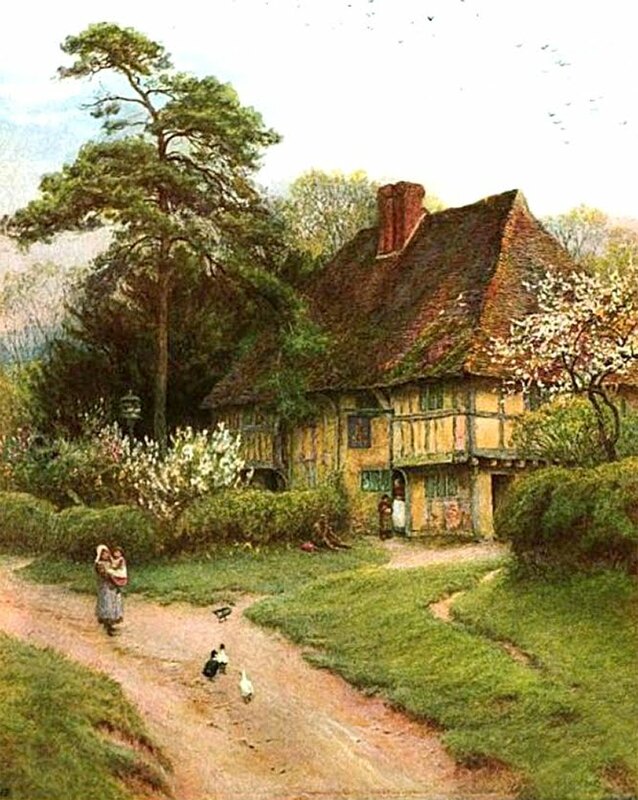 some sketches by Helen Allingham and other 19th Century English artists. Perhaps a more accurate question would be: Should Christian wives comply with unscriptural requests from their husbands? In a Christian home, the husband is a leader only within the will of God contained in His Word, the Bible. A man cannot arbitrarily make up rules and laws and commands that do not fall in line with God's Word. He is there to lead his family closer to God's Word, not to lead them away from it and endanger their souls. He must not give orders that violate the scriptures or cause the wife to disobey God's ultimate commands. Let me state, before you decide not to continue reading, that a husband has no scriptural, spiritual right to forbid his wife from attending worship services, or to discourage her, prevent her, or put problems in her way, to make it hard or impossible to be a faithful member of the Lord's church. In cases where the husband has grown discouraged or lost his enthusiasm, the wife may be able to use it as an opportunity to "show by her conduct" what is right, and do all she can to be faithful. It is also important to state that as a general rule, no husband with a responsible heart will ever create what I call "authority by proxy" situation. This occurs where a man will put his wife and children under the authority of other people. A husband cannot insist his wife put their children under someone else's authority (public schools, the medical establishment, etc.) Sometimes a husband will read something about marriage and decide to follow the advice of an author. All of my life I was told to "watch those authors" because you cannot learn about your mate from a book. Living by rules that are someone's else's authorship or ideas, can cause more strife and more resentment than to begin with. So husbands need to learn to live with their wives "according to understanding" as the Bible teaches, not according to the prevailing culture, a certain author, or the way everyone else is doing things. The New Testament book of Titus, chapter 2 outlines the activities of women in the Lord's church, showing how the older women are to teach the younger women to care for their families and to be keepers at home, "that the Word of God be not blasphemed." And these things give in charge, that they may be blameless. But if any provide not for his own, and specially for those of his own house, he hath denied the faith, and is worse than an infidel. If a husband truly understands God's word, he will not hint, ask, pressure, demand or command his wife to "get a job." He is less of a man if he does, because he is expecting her to be a provider. The Christian husband is supposed to be the provider. When the wife becomes a co- provider, she takes on the responsibilities that God has given to her husband. The man loses a piece of his masculinity and will be forever dependent on his wife's salary, and she forfeits a part of her natural womanliness by leaving the feminine concerns of the home that were designed for her by God. The husband becomes dependent upon her salary and loses his sense of urgency and drive to earn a living. Instead, a Christian husband should be dependent upon his wife in the ways that require her feminine strengths to care for and guide the home. Her work at home advances his health and well-being so that he may be motivated to make provision for his family. Christian women have a spiritual obligation to be keepers at home: Titus 2:5. When a woman goes to work outside the home, there is great neglect of the family, the house, and other home-based obligations.Being home protects her from the stresses of other people's work schedules and other people's demands and dominance over her time and life. Being home provides her with the freedom to be creative in her management of her time and her work. If a man really wants to protect his wife, he should not send her to work where she will be under the authority of other people. Where God has already spoken, no man can over-rule. Where God has been specific, we are not free to make up another law that contradicts it. Titus 2 is direct: women should be taught to love their husbands and children and guide the home. Being keepers at home gives them more time and the opportunity to extend this love and watch over the things that go on in the home. Since Christians are supposed to be different from the world, being a keeper at home will let a woman's light shine to a world walking in spiritual darkness. Her example of dedicated home-keeping will be a stabilizing factor in a confused culture. A man whose wife is home should be very proud of the fact that she is doing this on his provision, whether it is a small income or a great one. The husband as a provider and the wife as a keeper, guard and guide of the home is like the sun and the moon being in their rightful places, each one doing its job but both working together for the good of the earth. The man and woman in their rightful roles will bring blessings to the home. Although we might not "see" all these blessings, we must remember that many spiritual blessings, such as the favor of God, love, peace and happiness abide in a home where God's law is obeyed. The New Testament contains these lovely words from the book of Titus, chapter 2. I have removed the numbers of the verses (which were actually added some time after the translation of the Bible), to allow it to be read as a whole, without the numbers in the sentences. sound speech, that cannot be condemned; that he that is of the contrary part may be ashamed, having no evil thing to say of us. who gave himself for us, that he might redeem us from all iniquity, and purify unto himself a people for his own possession, zealous of good works. These things speak and exhort and reprove with all authority. Let no man despise thee. Notice the men are told to speak the things of "sound" doctrine and be "sound" in faith. Requesting their wives to support the family and seek paychecks through employment, is not sound doctrine and does not show faith in God's Word, His pattern for life, or His commands. Pressuring the wife to work shows ignorance of the Word of God. It also shows a man who is under peer pressure from other men, usually in his place or work, because they have their wives working, too. (At home, a woman does work!). What this is all about, is the desire for money. These days, there are erroneous religious teachings being spread about obedience. False teachers declare that a woman is obligated to go to work outside the home when her husband wants her to, because she should obey her husband. When the apostle Paul was told by a government authority that he should not preach the word of God, he replied, "We ought obey God, rather than man." Acts 5:29 These days, if a man asks his wife to get a job, she will comply out of fear that he will leave her if she doesn't, and yet, when a husband asks a wife to stay home, even Christian women will refuse. My opinion is that people pick and choose what they really want to do, regardless of scripture. There is nothing more powerful, next to the word of God, to win people, than a good conversation, and the careful discharge of relative duties. When a husband asks his wife to bring in an income, he is asking her to disobey the word of God and to neglect her home. The word of God is blasphemed when Christian women are distracted from their main purpose described in Titus 2. Her response should be to fully carry out the duties of home keeping and to do it well, giving him a good example of a Christian woman's duties to the home and family. I observed a woman whose husband once attempted to say jokingly, that she should get a job. She responded, "I'd do that, honey; I really would, and with all my heart, but first I must finish the laundry, ironing, cooking, sweeping, gardening, teaching the children, cleaning, paperwork, sewing, mending, knitting, teaching younger women, sorting the family mementos..." She named off more things on her long, long list of things that needed to be done at home. Another woman told her husband, "You do a MUCH better job at providing for the family than I ever could!" When a Christian husband humbly wants to obey the Lord in all respects, he will not ask his wife to do things that violate her own commitment to the Lord and His teachings in Titus 2. There was a time when most people on the earth, even those not religious at all, would not argue about the women being allowed to stay home and be in charge of the inner workings of the household. Most people thought it was as natural as breathing the air. If anyone asked a woman, "Why do you stay home?" or "What do you do all day?" they would have been treated as though they were a dunce, and given a scathing glare. You simply did not ask questions like that of the dedicated, hard-working makers of homes. Little by little, through modernist thinking and teachings in women's studies classes, the freedom of women to be home as caregivers to their husbands and guides of their children, has been eroded, until now, even Christian preachers have been heard to say, "I think it is okay for women to be home, unless the family needs a second income," "Women should be home unless there are no children," or "Christian women should be full time homemakers, when possible." The "when possible" phrase becomes the exception clause that is added to Titus 2. I can't imagine these men using the "when possible" phrase regarding really important doctrinal matters, but when it comes to money, the fake exception clause comes in handy. Imagine adding this fake exception to the verse commanding a man to provide for his own. I do not see such exceptions in the verses of the Bible which command men to provide for their families and women to be keepers of the home. The scriptures do not give husbands authority to turn their wives into co-providers. When a man asks a woman to "help-out" financially, there are a number of ways to do this without leaving her post at home and working elsewhere. These include preventing the income from going out as fast as it comes in by reducing expenses. Many women can stay home, but do not want to do without visits to the nail salon, hairdresser, restaurants, daily coffee's at drive-ins, several vehicles, extensive travel expenses, shopping at high-end clothing stores, and entertainment. These things can all be substituted in other ways that will not involve the wife going to work, which can perhaps be explained in a future post. Thinking Housewife has posted a pointed poem by one of her readers on this very subject. I love to have your comments, and if you don't feel free to reveal who you are, you are welcome to post anonymously. Someone commented about this post on another blog, which has good advice on it for women at home. After all is said, written and studied, it is up to the woman to develop a personal belief about the matter. No woman will ever be forced by the church members (at least, the church I am a member of) to stay home. This decision is always left up to the individual and no pressure is ever exerted on anyone to do anything they do not wish to do. Each couple should seriously study the scriptures as to how that decision will influence others. They should not claim that a preachers wife or any other church member told them what to do. The scriptures are available for everyone to ponder and to digest. I encourage everyone to develop their own personal conviction based on scripture. I will add that when you take on any work responsibilities other than your home duties, you give up your freedom to be "just a housewife." If you go to work, you may find it impossible to ever return home full time again. Also, you do not have to be debt-free or have every expense accounted for. You may find when you stay home, that bills get paid, and you will find that at the end of a month at home you are nowhere nearer to living under a bridge than you imagined. One thing many women and men do not consider is that being a homemaker is largely a matter of faith, and with it may come unexplainable success. This is one of the most read posts on this blog. I will add a few more things from time to time. Right now the subject of "taking care of my family" has been presented to me. Should a husband demand sudden changes for his family that could cause danger to their health and their physical and emotional well-being? A husband may, in the name of economy, think he should downsize his family possessions until they have nothing, or sell the house so they can all go live in tent or a van down by the river, and thereby become more spiritual and less material. But this is not good judgement. Its very traumatic for wives and children to be living on the edge of financial disaster all the time. One of the mistakes the teachers of women have made, is teaching women who already are very thrifty, to reduce expenses and make it less stressful for a man. But this will backfire, because it makes some men free from the obligation of earning a living for their families. Making money and paying for family expenses is "good stress" and motivation. It provides the kind of drive a man needs for life. It gives the husband ambition, accomplishment and a feeling of satisfaction to provide well for his family. To a great extent, he depends upon his wife to keep him centered and grounded. His work provides more than just the material needs of the family. It gives a good example of Biblical manhood. Too often, women feel intimidated about the expenses of life, and try to cut corners financially, to make it easier on the husband, but I am not talking about women who buy high-end clothing, jewelry, or pay for hair and nails. These are already sacrificial women who are dedicated to the home. They also will make the mistake of reducing the jobs of the husband when he is home, so that it frees up more of his time. This can bring unhappy results too,, as a man may think he now has time for another business, another job, or a ministry that takes him away from his family. So be careful not think you have to live like an inferior creature, constantly thrifting, not wearing new clothes, denying children new coats in winter, just to give the husband a break. He needs the responsibility and it helps him show love to his family. Basically, many good women feel guilty for staying home and not earning money, so they live in an inferior way, not thinking they deserve anything above that of a servant. This is not a good example for the husbands and a very sad way to raise children, who observe their subservient mother and her sacrifices. They in turn may not think they deserve anything more, either, and choose mates who treat them without respect. So the woman must realize she is in a position of authority in the home, as the guide and guard, according to scripture. The original Greek words about guiding the home, mean "to rule" the home, as a captain would organize his army, keeping account of everyone and everything. The wife is not there just to work and clean house, but to advise and counsel and direct the home and family. The man is head of the wife in the role of responsibility. He is responsible for her, the way Christ is head of the church: not as a demanding boss,but as a someone responsible for provision, protection, comfort and many other things. There are some religious marriage books that have made their way into the homes of Christians, and they do much harm, as they make the wife inferior. In the New Testament, the woman is not inferior. The man and wife are "heirs together" in the grace of God. Make sure as a woman that you don't fall into a brain fog of letting your thinking go by the wayside. You can easily check out your alertness. You need to guard your husband to see that other people don't influence him to do things that would endanger the family stability. I mentioned some of those things at the beginning of the article: moving away to a dangerous place, living roughly with no sanitation, conveniences, comforts, trying to live without money, quitting his job so he can go into ministry, raising children to feel like inferior creatures, etc. Women have an instinct for the home, for family, for life, and they should guide the men to a better life. They are allowed to communicate their needs to their husbands, and men are commanded to live with their wives "according to understanding." Ist Peter 3:7. The goal of your family should be to live better and to do better, so that you may be able to help your children and grandchildren get a good start in their adult lives. So women can keep their husbands encouraged to provide an income and to protect the family property and posessions and to be a "house-band" for the family. A husband is the band that forms around the home to keep them intact, safe,protected and provided for. I have been very blessed in this area and have a husband who is the provider of our family. I believe that in families today they value stuff more than family and that puts such a pressure on the families finances. So many have fallen into this trick of the enemy to get both parents out of the home, then he has a straight shot at the children. We need more teaching on these lines in our churches today and I feel we could take back a lot of territory in the area of Christian families. Thanks for sharing your heart and love the blog. God BLess! So true: the children ultimately pay the price. If you are blessed to have children, stay home with them, even if it means you cannot have the luxuries of life. Time away from them can never be recovered and you may regret giving up so much of that time for the pursuit of career. We were taught that the moment you conceived you had made the decision to stay home with the child. Now we are hearing that everyone has a choice, and too often the choice is to sacrifice time spent with the children. If women want to "help out" their husbands, they ought to learn to cut the children's hair and style their own, as well as keep their health through good nutrition and proper rest at home, sew some of their own clothes and home furnishings, decorate themselves, and buy things at discounts. They can grow some of their own food in summer, and they can entertain at home or in creative ways out of the home without cost. They can learn how to live conservatively so that heat in winter does not go straight out an open window or door, driving the heating cost up, and they can learn how to use products sparingly, so that things like soaps and paper towels, and even food, do not end up down the drain or in the trash. Most of the objections I receive when I write posts like this are concerning THINGS. Girls think it is terrible to deny the family luxuries and things, when in the end, a child will wish his mother had been home with him, whether or not he had the latest style of shoes or video games. However, even without children in the home, there is still a lot a woman can do to make the home a place of refuge, things that will fill days and weeks, months and years. There is no reason to be bored at home if you look around and see all that needs doing. This was an interesting read, as I have always heard it argued that a wife's Biblical responsibility was to respect her husband and follow his lead. If he led her astray, then that was something he would answer to God for. You made very valuable points to consider, however, and I appreciate your bravery in tackling a topic that often leads to argument or critical comments. A Christian husband has no scriptural authority to step outside the scriptures and lead his wife astray from the word of God. A woman is supposed to be a help-meet to her husband. She is not a help-meet if she goes along with error. She is actually participating with him in his rebellion against the scriptures when she agrees to do something against scriptural authority. A man is an authority appointed by God to help carry out His will on this earth. He is not here to carry out his own agenda or his own will outside of the word of God. Women must remind their husbands of what God says, and not fall into the trap of going along with something that is not right, just because he is a husband. A husband is not zapped with special spiritual abilities just because he is the head of the wife, and a woman is not excused just because she followed her husband into an abyss. I hope there will not be an argument over what the scriptures say. I think some preachers have really preached "around" the issue, allowing everyone to think that Titus 2 doesnt really mean what it says. There does not seem to be any scriptural support of the belief that women should go along with anything ungodly if their husbands demand it. Women need to be alert and smart enough to know when their husbands are going the wrong way, and gently guide them back to God's word. They are not obligated to follow them blindly into things that are wrong. They are duty bound to warn their husbands and waylay them when they are leading the family into spiritual danger. as the saying goes crassly..."you nailed it" with this essay. My husband is a good provider. We are proud to be a one income family. God has given us much wisdom in the art of frugal home living with children. Jamie said: "This was an interesting read, as I have always heard it argued that a wife's Biblical responsibility was to respect her husband and follow his lead. If he led her astray, then that was something he would answer to God for." He will answer to God, but so will she if she knowingly sins. Ananias and Sapphira come to mind; she agreed with him to lie. If she had refused, perhaps she could have persuaded him to honesty. And if he refused to listen, it is still better to obey God than man. Thank you, Rosemi, my young cousin! I really feel that comment about the enemy having a straight shot at the children is wonderful word graphics....very clear picture she paints with her words. Oh yes, thank you for reminding us of the Christian couple in the early church who both lied. Sapphira was given a chance to tell the truth when she came in the room individually. She might have lived if she had not agreed with her husband to lie. She could have been a better helpmate to him and helped him do what was right and gain the reward of God's approval. Esther the Queen also put God first, and Abigail, married to Nabal, did not cooperate with his mean ways. Sadly, I am seeing alot of homeschooling moms go back to work and even school. What I am also seeing, because several moms in my home school support group are airing their struggles, is the education of the children suffering because mom is tired, the home in utter chaos as far as cleanliness, laundry, etc., and just a sense of general feelings of being totally overwhelmed. When you mention that perhaps working outside is causing this they get very defensive. It is hard to help or offer Biblical advice:-( I only have three out of my five children home now and while the load is lessened the days are just so full with "keeping home". I thank God my husband values what I do here and wouldn't dream of having me seek outside work to "help out". Homeschool moms are indeed falling into the temptation to neglect their homes and their children. It is always shocking to see it, since it is usually about money. Once money becomes the center of thinking, it rules over a person until they obey the urge to leave their duties of the home and the children. Thanks for your comment. Women do "help out" the finances in many ways, whether they know it or not. If they are in the country and have their own chickens and home grown veggies, they are providing food for the family. These days groceries are so high as to take a full salary from a family, so her contribution can be her garden and her livestock. Or, she may sew or knit their own clothing and know how to repair their own appliances. Just keeping the paycheck from going out as fast as it comes in is a skill. She may also be earning money from her own talents at home, too. I know someone who rents a guest house on her property in the summer. There are a lot of ways to bring in money without neglecting the children, even if all you do is not spend it. It is possible that the belief that a wife should obey her husband even when he is doing wrong came from a religion that has a prophet that wrote something like that in one of the books that religion reads. I see nothing of it in the Bible. Abigail of the Old Testament would not go along with her husband when he would not let people pass over his land peaceably. In civil law, women who participate with their husbands in something that causes harm to others are punished as "accessories"
--in other words, they aided and abetted the unlawful behavior. In the Bible, God commands men to be the providers (how they provide is not given, so it could be either by money he already has or by his wages, and we assume that he would earn it honestly)...and a woman is to be a guide of the home, which means she probably guides what some of that money will be used for. If she is wise, she will be able to protect the income from mis-use and protect herself thereby from having to go out to work. I will admit to not knowing scripture, but I thought there was a part that said she could help her husband if money is needed. Whether we like it or not, we have to have money to live. In today's economy, there doesn't seem to be enough to go around with rising food and gas prices. We are a one income family. We have a modest house. We do have two cars, but my husband works far away, 12 hour shifts first and third, and I need transportation. I used to have to take the kids to school (no bus since they were going to an out of district school) and now I need it to go to co-op and playgroup. I do not spend money on clothing for myself. I wear hand me downs. I shop at Goodwill for the children. Haircuts for the boys are done at home. I do take my daughter to my beautician for trims every once in a while. I get haircuts a little more often because I have a short hairstyle. All in all, we save as much as we can. I will not go back to work unless I have to which could be for any number of reasons. Mostly for food and shelter. I am wondering what to tell the women who work for insurance benefits because many women do that. Not all jobs were offering insurance. Some women work because their husbands can not make a salary sufficient enough to take care of the family. The days of a highschool graduate getting a job at 18 and retiring from that job are long gone. While I understand that Christians take the Bible as the literal word of your god, it was written in a different time with different circumstances that do not always apply to modern day society. I am not a Christian and still find this very sad, but what can be done to change the whole? I can not imagine a loving god turning his back on his child because she had to feed her family and the husband, in spite of doing all he can, couldn't quite make it alone. To "help out" a husband, take care of the family property, whether it be large or small, and the good maintenance on house and belongings will prevent major expense later on. When you let things deteriorate, or use appliances roughly, or treat furniture carelessly, it cost more to replace them. A lot of people have the idea that they will just kick things around and then replace them later. Who knows that there will even be jobs available. If this is such a poor economy, as the media portrays it, there should not be any employment available anyway. Excellent post Lady Lydia! I agree, it is scriptural for the wife (children or no children) to not work outside the home. My husband knew before we were married that he wanted his wife to be at home and his reasons at that time were not because it is Biblical but because he would personally feel embarrassed to have me work because he feels he should be able to provide and if he isnt providing 'enough' then something is wrong with our 'wants'. Of course later when he became a Christian he had scripture to back up his feelings of me staying at home. I think men, in their heart of hearts, really feel like women should be home. Men want to be the providers. I dont think God created women to shoulder the finances. Even sounds silly when you think about it. God made women feminine not masculine. And its a masculine thing to work outside the home. I read someones comment about some homeschool moms/homemakers neglecting their homes. I think the problem there is that they have junked up their homes with too much clutter. If were going to be wise homekeepers, we need to make it easier on ourselves in order to get all of our duties done. One huge way to do that is by having less stuff. Or having only things you need and love in your home. One can have a beautiful homey home thats easy to keep up with by simply having less stuff. This is one reason I post creative things you can do for the home. It satisfies the desire to have something pretty and something decorative, yet it is usually made with materials that are not costly. I believe that women need to pay more attention to their dwelling places, and even without children, there is plenty to do. If they have no children and can earn money without taking on a full time job, being home is a great advantage. There are many women who earn money but they are not under pressure when they just have a few things they make. The best way is to prevent the money from going out the door as fast as it comes in. This is a sacrifice for those who are used to buying high-end things and living in an expensive neighborhood, so it will take learning and adjustment. For country women, it is often not such a hardship, as they have more resources to make things and to make do. Often the distance to a job place would be too far, and too costly and the wages wouldnt even cover it. So it is important to be content at home, especially if you are in the country. Ladies, your input is appreciated to answer the comment from GoodLittleHousewife! You probably all have great ideas. Thank you! First of all, homeschooling would cut out the necessity of meeting buses and going to play dates, as you can do it yourself. In being frugal, and living on God's provision for us, we have to learn to not be dependent on activities that cost money, even transportation money. Second of all, you can live without some things and some activities. Think of what you could NOT do without that you would absolutely die if you didnt have: food, for example. Use money for things you cannot do yourself, and do as much yourself as you can. God is a loving God, but also severe, as the scriptures say "Behold the goodness and the severity of God," which is in the book of ROmans. It continues to say that he is Good to those that obey him and severe towards those in rebellion. A lot of people just want God to be loving, with no severity, but unless you understand parenting, (whether or not you have ever been a parent) you will not understand God. As parents, we give our children lots of favor if they are compliant with us and honoring.If they are rebellious, we tend to be more firm with them and even resist them. Very interesting especially for me. I am a wife and mother whose husband desires that I work outside of the home. I consider my husband my head. So I felt I was doing the right thing, by placing his desire for me to work above my desire to be at home. In not so many words, my husband has said he would not be able to handle the stress of being our family's sole provider. To him, money equals security. And while we could manage on just his income, having two incomes will allow us to pay off our home in full faster (something that is of importance to my husband). He also see two incomes as protection against job loss, which we experienced a few years back. It was my income and insurance that kept us going during that time. I'm not sure I could unilaterly decide to stop working without damaging my marriage. My husband just does not see any added benefit to me being home full-time. His friends who have wives that stay at home, are always complaining about how their wives don't keep the house clean or cook. I do all those things in addition to working. So my husband feels there's no need to change. The Working Homekeeper, I see this in men a lot. They are afraid and with good reason. My husband, years ago, was fired from his job because he made too much money and they were trimming the fat. He and several other employees were let go. I could not go back to work as I was very pregnant with my oldest. We lost everything, house, car, my wedding rings, had to sell a lot of our belongings in order to move where we live now. This was nine years ago. It seems that there are jobs to be had, but the only people hiring are low paying jobs unless you have a college education. My husband's employer is paying to put him through school right now, so we feel he has job security for the first time in his life and I feel so much more secure because of it. It gave me another reason to begin homeschooling again. If you are wanting to stay home full time, would he be willing to compromise by putting your paycheck in the bank until you have saved up enough money to have three months worth of bills (more if possible) then you quit? He would have the security he desires and you would be able to do what you desire as well? Women are supposed to be under their husband's authority but at the same time, husbands are also obligated to be under Christ. She is to submit to the Lord first and then to her husband. She can be in submission to him as long as she doesn't have to compromise anything between her and the Lord to do that. As soon as he requires something of her (i.e. go to work) that will compromise her relationship with God she is no longer responsible to be in submission to him on that issue. She is not responsible to bail him out. A man who wants his wife to work to support him or "help him out" is in horrendous rebellion against God. It seems a lot of men these days who are lamenting about feminism ruining the society and the church are some of the very ones who send their wives out to work. By doing so, they are only making the situation worse, taking jobs away from other men, and actually helping feminism to destroy the church and society. I'm speaking of professing believers and non-believers. Since a great deal depends on how much you respect the Word of God, and how determined you are to live within its teachings, you might find it more difficult to be the kind of homemaker described in the scriptures. It was not written to non-Christians or to unbelivers, and without faith, the Bible says, it is impossible to please God. Many women are in the same place you are financially, and even in debt, and still have the wisdom to stay home and guide things at home. It has more to do with allowing God to guide your life than it does with adding up the figures and making sure they work. As I said, it is largely a matter of belief, and living that belief. Respect for the WORD OF GOD, contained in the Bible, as your first authority is necessary in order to live out the Lord's command to be keepers at home. It often comes as a surprise to the modern women that some women do not want to go out with the herd and seek wages outside of the home. The older generation of women seem more feministic than the younger generation, sometimes. They have a lot of feminism bred into them from youth. What I am getting at is that if your husband can not afford to provide the basics on his own, how are you supposed to survive? Would God think it was bad to help take care of your family financially? Thank you, Lady Lydia. As always - an encouraging post. Though you mentioned it in passing, I was wondering if you'd ever done a post on the proper approach to mate selection and marriage? Either in the post or one of your comments, you'd mentioned something about marriage being a contract between a man and a woman, etc. I was wondering if you'd ever done a post on this, or if you will be doing a post on this? It seems to me that many of our family and marital problems can be traced to poor mate selection and marriage practices. I do not feel prepared to write extensively about it but the so-called contract was like an unwritten understanding that in exchange for the woman living with a man, he would provide for her and give her children his name. That was a great honor for her and for him, a great honor that she would be in his home and raise the children. Most people understood this without having to spell it out. It would be difficult to explain this today because of the habit people have of living together before marriage and having children not all related to the same father or mother. It would be quite confusing to unravel it in some cases. If the fathers would be particular about who their daughters married, and not release their daughters for marriage until a man approached the father and asked to be considered as a son in law, it would eliminate a lot of foolish decisions. I was asked a similar question some time ago about posting concerning proper selection of a mate, and have considered writing about it. This is a question for the ladies that feel their marriages would suffer, even to the point of divorce, because of the conviction to stay at home. Would anyone here be able to defy their husbands wishes, knowing it could cost them, at the very least, peace in the home? I'm so very blessed to have a husband that wants me home. Even though I am college educated, and can get a job anytime, I never got him in the habit of expecting me to work. It seems as though this should be discussed before marriage.I would run very far from a "man" that expected 50% of income from me. We did struggle, for many years, but guess what? Here we are, financially sound, more so, than alot of our friends and family. We look like we "have it all", when in fact, careful handling of money, and frugal ways have served us well.Should a wife disobey her husband, even at the cost of her marriage? If what a Christian husband orders interferes with the will of God then his will is annulled. I'd say that either full time housewife or part-time working mother for Christian women. I'm not a libertarian or a liberal, I'm a traditional conservative Christian woman. What I'd like to know is how anyone can debate that Titus 2 clearly says. I can understand having disagreements about baptism (immersion vs. sprinkling), but how can there be ANY ambiguity about wives being keepers of the home?! One word, brother; Feminism! over the past 45 years, and traceable back to the latter 19th century re 'familiar work model' - think of the factory girls employed to make clothes or matches) feminism that claims to uphold woman's choice but in actual fact only does so when it suits their narrow liberal distructive ajenda, is at the heart of misinterpretation of Titus II, along with the German Academic revolution from the mid 19th century onward not to take the Bible literally - think the Critical Historical method of Biblical study - Documentary Hypothesis etc that has swept through vast tracts of the Christian landscape from the seminaries downward. It was this that Cornelius Van Til and R. J. Rushdoony fought so valiantly to counter, on the shoulders of heroic men of God in both the US and Europe. In Australia, Broughton Knox served to keep the flame of Biblical truth alight - sadly, even in 'Bible Believing' evangelical circles, they pick and choose what they will take at its word... In the UK, Gerton College, opened in 1874, enticed women away from the upholding of Titus 2 and into the masculine domaine. This is the merest of offerings that attempts to chart the rebellion and devolution of society firstly within the Christian sphere, spreading to wider society. Marx is the true crowned criminal in this situation - read the Manifesto and you will confront clear as day, in plain, unmistakeable print the call to destroy the family. This is not interpretation; it is on the page, and it was this shocking discovery that turned me from all variants of Marxism be they communist or Socialist in nature!! This is why I am a Subsidiarist after the example of G. K. Chesterton. Borrow this from the local library and read for yourselves. Our Churches of ALL denominations are in a terrible mess regarding the truth on gender roles; and this from a university educated woman who knew no better and was taught no better either by my beloved late Christian mother or the Church itself; where Titus 2 was not even considered. You could never be a secret agent. I recognize you by your online accent. Sarah, did you not think there was more scripture sung and spoken in the Royal Wedding than in most churches on a Sunday? And what did you think of the statement that one of the ministers made about Britian and the world moving away from God's word and more into a dependence on one's spouse for happiness and security being unscriptural, or something like that. He encouraged the couple to follow God's standards and help one another to do so. It was fascinating to behold that these scriptures in songs and in verses (Romans 12 was practically memorized by the bride's brother) and prayers were broadcast to the world and to the Royal family. I was glad to see and hear teachings directly from the Bible, and I did not detect the political correctness and modernity that I expected. I hope the whole of England will be blessed because of the proclomation of God's word at that wedding. There was also less immodesty in the wedding than I've seen in churches today. Maybe the example will lead women to cover up better...there was still improvement needed but it was not so embarrassing as I've seen in weddings today. At least there were sleeves, which I have not seen in weddings in years. I dont know if anyone has seen "Chuzzlewitt" by Dickens on film. There were two sisters called Mercy and Cherry who were both a little unrefined and ungainly in their appearance and manners. It was intentionally designed by the writer and the producers of the film to make them appear a little silly and undesireable. There were two young women in the wedding audience with very, shall we say, "outstanding" hats which looked like deer antlers. I did not know who they were and dubbed them Mercy and Cherry every time I saw them, for they reminded me so much of those two amusing characters in the Dickens story. Your quote about the gender roles being confused from university on down, called to my mind the statement in the movie I recently recommended, "The Lightkeepers", where the younger woman said that a strong dose of college had left her skeptical, and the older woman said, "That is the reason you are not married." This all depends upon whether you and your family are actually seriously following the Word of God regarding men and women's duties and responsibilities. One is, "If a man will not work, neither should he eat,"
"... if any provide not for his own, and specially for those of his own house, he hath denied the faith, and is worse than an infidel. The Bible views an infidel as bad but a man who does not provide for his own family as worse. The question you should be asking is, "How are we going to make it possible to follow God's word in regards the husband providing and the wives taking care of the home?" God has given the command, and his followers must then do their part to cooperate with him by finding ways of doing it. One comments admits they are not a believer and do not know the scriptures. These words in the bible were written as instructions for those who claim Christ as their Lord and Master and ultimate authority in all things. We expect men and women outside of Christ to live contrary to scripture, but it should not be prevalent in the church, or the body of the saved, that is those committed to take up their cross and follow Christ. Sometimes people standing on the outside of Christ want to follow him, but find all kinds of reason that they cannont. Christians who live by faith can do the things that the world constantly complains are impossible. The things I write on this blog concerning this issue are based on the Bible, and are for Chrisians. I don't see any point in arguing with those who do not claim the Bible as their authority in this matter. Faith is the ingredient in the compliance with the scriptures. You can follow them without belief and love for God, but when a problem comes along, it becomes easy to abandon your resolve. MM: the modernist or emergent use debate to water down the point and arrive at no conclusion except that people may do whatever they wish, and God is a loving God and he approves of them no matter what. Those who knew Karl Marx wrote that he was so contrary and full of arguments and debates that no one could speak to him without getting in an argument. He could turn an approval of the sunniest day into an argument by showing the dark side of it or the impossibility of it. The debate over men and women's roles come ultimately from those who love the idea of equality so much that they end up loading down women with more equality than they can stand: they not only bear children, keep house and take care of their husbands, they now have to have degrees and work outside the home, bringing in more money than men. Not only that, they are still expected to look and act feminine. The burden on women is terrible. That being said, no man can truly "make" a wife do anything if she does not really want to do it or is determined not to do it. Most women do as they please. You have to have a wife with a belief that goes so deep that changes in the world, changes in circumstances, changes in the culture, and trends will not change her belifs and the way she lives. Case in point: a husband might ask his wife to dress more femininely and not so much in jeans and tee shirts, and he may also say he likes her hair a little more femininely done, instead of looking like a boy. Then he might say he will be glad if she gets a job, too. Of those three things, which do you think the woman today will comply with, and which do you think will make her feel like saying, "No one tells me what to do"? Which of these things would she be most likely to reject? What she believes will determine how she responds to each of these things. Most of the time, even Christian women will reject all of these suggestions except the one about getting a job outside the home, which seems easiest to them! Most women choose what they want to do, and some women choose what is right to do, based on scripture. Whatever one's denominational affiliation, these are equally relavent. I listened to some ladies from Mali interviewed this morning who watched it and vocally expressed their wish that this beautiful, Godly witness to so many around the world will cause young women (and men) to comport themselves more decently and exercise better levels of behaviour. I pray this ushers in the beginning of the turning away from the culture of secularism, lies, political correctness and indecency, forward to a culture of decency, civility, mindfulness, modesty and God-revearing Christian faith - that the latter rain of the Holy Spirit may fall upon this parched land, that the dried bones of Christian faith in the West Especially would by God's power be reborn into newness and viggor of life!! Contract: 50/50 "You do this and I do that." Convenant: 100/100 "My life for yours." MarkyMark, I think the divorce rate among Christians reflects a lack of commitment to God (ex., a person who commits adultery isn't committed to God), so it seems a lasting, happy marriage would be more likely with a person who loves God and is committed to obeying Him. Anonymous, I agree with you. A person should choose a mate who would never go against God's word, and knows enough of it to know what is wrong and what is right. If you knew someone put God first that way, you would be sure they would not do you wrong, either, as they would live up to their principles to God and to others too. Lydia, those two young girls who were dressed more for Halloween or like actors in a London "Jack the Ripper Tour", are none other than the Princesses Beatrice and Eugenie, daughters of Charles' younger brother Andrew and his ex, Sarah Ferguson (the infamous Fergie). They are William's first cousins. I think they were being smart-alecky about the whole thing and were apparently allowed to be. 1. The designer. What was he thinking? And do we wear hats on the head now, or the face? 2. The sales person who sold her the hat. Did that person tell Beatrice that it looked good on her, or was she just trying to make a quick sale to a naive girl? 3. Her mother. Sarah should know what humiliation feels like, as she has regretted many public things she has done. Does she want to send her daughters down Humiliation Street over and over again and make them endure suffering that she could prevent? She could use her experience and knowledge to help her! 4. Her father. He did not look enthusiastic about their looks, as he sat between them in the audience. Fathers used to be very particular about what their daughters wore in public, even to the point of stopping them at the door and sending them back to change into something less eye-boggling. 5. The royal family must have a staff of some kind that peruses the close relatives outfits and approves or disapproves of them. WHat happened? I think the girls just did not understand that the carnival type hats were supposed to be worn by the more casually dressed crowd standing outside. However, the man who created most of the hats for the Royals at that wedding, also created Fergie's daughters hats, so shame, shame on him for making a laughingstock of those poor girls. Its a case of the Emperor's New Clothes--convincing royals that they look nice and taking money for it. I hope the designer gets sent down in disgrace and real millinery comes back into fashion. Somehow the hats that those two sisters wore, (and a few of the other garrish looking hats) distracted from the holiness of the cermony. The Word of God was prominently projected to the whole world that day, and the camera kept catching those two girls and their outfits, which seemed to be rather mocking. They should have had to pass an immigration/customs inspection before they entered the building. They looked like aliens and took away the sweetness of the event. The photographers also bear some responsiblity in that they did not realize what disrespect this would show the world about the royal family and the solemn event they were attending. THe hats drew attention away from the holiness of the event. I like this post. If only people could see that where God has already given women permission to marry, have children, be keepers at home, teach younger women, and carry out the role He intended, they do not have to get permission from anyone to do it! The duty of the husband is to make it easy for the wife to obey God in these things, not to go over God's head and decide things that God has already decided. I was so very pleased when I saw Catherine Middleton's wedding dress...truly, it was one of a few things that made me tear up just a bit! She looked elegant, respectful of her own wedding & the guests, & I believe she will not regret having chose as she did. I did hear various (slightly veiled) snarky comments late on about how it made her "look old", or it wasn't "dramatic enough", which tells me quite plainly that people have come to view weddings as fashion events for the bride & barely anything else! What do they want? Over-the-top, hardly wearable dresses, it seems...sigh. As to the overall religious quality of the ceremony: That was another thing that pleased me enough to bring a tear to my eye. I kept waiting to hear something that undercut, so to speak, the Christian nature of the wedding; I was immensely happy not to hear it! I'm thankful I recorded this event, as I could play it back for my husband when he got home. To Anon. 6:17 I would like to say, "Amen...and AMEN!" to her comment that "the dried bones of Christian faith in the West especially would, by God's power, be reborn into newness & vigor of life." This wedding ceremony today was such a fine Christian witness! I hope more people will offer solutions, by showing pattern numbers and sketches of clothing that would have looked better at this special occasion. I am blessed to have a husband who has always worked hard to enable me to be a homemaker. We married at 18 when he was just a young soldier,and now, 15 years and 6 beautiful children later I am needed here more than ever! Although I was saddened the other day when my 10 year old daughter commented how she wished she could be a mummy at home when she grows up,but young ladies arnt allowed to do that anymore are they! I explained that they certainly were! and she will make a wonderful wife and mummy and I look forward to all the lovely afternoon teas she will make when I come to visit!!! I read somewhere online that people were searching for phrases like, "Back in the days when women used to stay home." THESE are STILL the days. It all depends upon deciding to DO it!! Young girls should be encouraged to know that Christ gave them the freedom to be keepers of the home and to look after their familes, and yes, to have afternoon tea with their mothers!! When young women get jobs outside the home, they do not have the time to give comfort and aid to their parents and children. One comment suggests that a wife draw the line when a husband threatens divorce if she does not get a job and become a co-financial supporter of the family. There is no scriptural support for a Christian man to threaten divorce over a woman's refusal to earn money. There is no scriptural example of a man doing that. A Christian man who is truly following the Bible, will not threaten divorce or divorce his wife for her refusal to leave her God-given role as keeper at home. SOmetimes ignorant men, even if they claim to be Christians, will threaten divorce for everything, just to manipulate the marriage their way, and this is not in keeping with God's commands. I suggest that a man who threatens divorce if his wife does not get a job, is an immature boy who has not matured as a real man. Real men don't do that. A man who feels he must resort to threats is a man who lacks confidence in himself as a man. A woman can change that by building his confidence as a man and appreciating his efforts to provide for her. Christian men have no scriptural reason for demanding their their wives get jobs, and they have no scriptural reason to threaten divorce, or to divorce them based on their insistance on being homemakers. It may have been an A-line skirt in 4 gores, and she tried to shorten it by taping it up in the inside. With an A-line, the hem is wider than the area nearer the waist, and so when she folded it up, the fabric was too wide for the more narrow area it was folded up toward. If she had matched the seams and gathered the hem on the inside before taping it, the outside hem would have looked more even. How does one deal with christian men/women who insist that stay at home wifes/mother's are to have some type of job from home. This seems rampant and I can not find scriptures to back this up. Though Proverbs 31 is generally used as "proof" that a woman should do this. They seem to think it is o.k. for women to have two jobs but, not the man.In general it seems to pit men and women against each other rather than as a team working towards the same goals. I would really love to have you write on this topic in depth.To address the problems with this thinking. It is a topic worth discussing. It is outrageous that Christian men think about money more than they think about duty and about obedience to God. They want to be the breadwinner but they want to make the wife do part of it. The men should be doing the man's job of providing, whether he does it from living off an estate or investment or he does it from wages, and the woman must do the woman's job, which is to be the guard and guide of the home and all that entails. The men who want their wives at home to have some kind of business and bring in an income do not understand the responsiblity a woman bears in the home and especially if she has children. Even without children, there is a lot to do for the home. To heap more pressure on her is not Biblical or manly. A good wife contributes economically by managing the finances wisely, being frugal etc. She must learn to live according to her husband's income, not according to the Jones's income. The Bible warns about bad women who make their husbands so poor they 'll have to beg for bread. Literary example would be Madame Bovari, an adulterous wife who ruined her husband financially and then killed herself and left him with the mess. Much in the success of marriage financially depends on the wife. As she stays home she has time to investigate the best opportunities and make wise investments, that's what I believe Prov.31 woman was doing. She wasn't a real estate agent, she just managed family resources wisely. I think people should return to the private marriage contracts where they specifically discuss such things. If the husband promised explicitly to his wife that she won't have to work he has no right to break this promise, as it was one of the conditions of the marriage. Before the couple marry they should take measures to provide for the wife in case of the husband's death/disability. That's why we have insurances, private saving funds etc etc. There is no command that a husband threaten his wife with divorce if she does not obey him. Obedience is a matter of the heart, not of force. Even God does n ot force us to obey His word. According to the Bible, a man should not divorce his wife except for one specific reason and that reason is not "because the won't get a job." Therefore, threatening divorce for non-compliance to a non-scriptural command is not valid. For the women who work outside the home and find themselves exhausted from it, they should let the housework go. A man can help halfway, making them both half husband and both half wife. That way, they are equal in the sight of man. Or, they could both let the housework go. It all depends on what is most important to them: the wife working or the wife at home managing it. In some cases, when a husband sees the house falling apart and feels neglected, he may more understand why a wife needs to be home. I would much rather have peace with God than disobey His Word in order to have "peace" in my home. I have been in that very situation, although my husband's attitude has changed quite a bit in the last several years. There have been many material sacrifices, but the Lord has been faithful to meet all our needs. I feel He has been teaching me to trust His promises through all adversity. God will reward your obedience to Him and His commands. Well stated. Thank you. Terse and true. I find it difficult to explain my position on this other than to say that it is directed to church members, not to everyone. Others may follow it, but it is I think it is important to keep your humour and your sensibility and not panic, beg, plead, or behave in an inferior way. YOu must confidently mind your own business. To go to work would be to mind other people's businesses. Sometimes a husband in ignorance or immaturity will react in a threatening way but he will get over it sooner if the wife does not argue or act like she is resisting, and will make the home the focus of her life. He will eventually find out that she sacrifices a lot to make him comfortable. Women should teach men by their conduct, as the scriptures say. The Bible does not authorize the Christian husband to suit himself but to understand his wife. This is one reason that women need to be careful to check out a person's beliefs regarding the home and the duties of a wife, before marrying. Of course, some people can change their minds once they marry, but if a woman has a deep belief and a fear of God, she will stay true to God and it will benefit her husband. I agree with you. When the wives exhaust themselves working for someone else and then try to keep the home running, it sends a bad message. Men think that all women can do that, but women can break down from exhaustion after so much of that running. They will be frazzled by the age of 50 and they are not taking into account the many changes that occur in their bodies, and the harm they may be doing to their reproductive systems by keeping such schedules. I try to include leisure arts on this blog for the purpose of showing even the full time homemakers that they must not run themselves ragged just to prove they are pulling their end of the load of work. I think feminism has indoctrinated so many women that they cannot even relax at home and enjoy life as a wife, because someone might not think they are accomplishing anything. Notice how Kate the future wife of William said in an interview that you could ask anyone in her family or in places she had worked and they would confirm that she always carried her share of the load. She cannot even feel comfortable just being a companion to her husband and just being married, because she must show the world that she is a worker and not just there to be married. People treat marriage as though it is inferior to work or career, but a woman's career can be her marriage, as she strives to make the home a good place for her husband. You definitley got a lot of comments on this posting. I wonder how many view your site but didn't comment even though they agree with you. "IF" the issue really is money, they perhaps the man should improve his earning capacity. There are so many oppourtunities for men to earn money today, even without the internet. Sadly, some men don't want to learn anything new, and are buying into the rich ought to give to them. Most of us pray thy will be done on earth as it is in heaven. 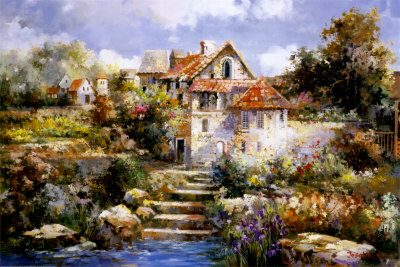 I have been taught that home should be a little bit of heaven on earth. Equally as sad is how men are taught that if you don't get what you want, get a divorce, and get you a woman that will work outside her home. I feel another thing is our children are not taught to save. (I even struggle with this at over 50). A young man still living at home with his parents should have no expenses, and could save most of his money instead of buying expensive toys and gadgets and tennis shoes so that he will have something to take care of his wife and home with. Just recently I have been thinking that with the cards I give as gifts in the future with money in them I intend to add a note to the effect of "be sure to save at least part of this for an engagement ring, and to have money to buy a house so your wife won't have to work." Sidebar: have you thought of writing a short story about a wife that works then makes a decision to stay at home. It is strange to think a man would want his wife in submission to another man. My question is still this: Should a CHRISTIAN husband (assuming he is sincere about following God's Word and will do so no matter what the circumstances or prevailing culture)insist that his wife "get a job" (also assuming he knows that her business is the business of the home)? And, considering that most women these days have a lot of feminist influence in their lives, I do have another question: Should a Christian father (assuming he knows the scriptures on modesty) ask his wife and daughters to dress modestly? I believe that even Christian women will comply with the first request and rebel against the 2nd request. In almost every case, a woman will quiver and rush to work when her husband demands it and will boldly refust to dress modestly when he requests it. I see such hypocrisy in their pick-and-choose obedience, and they do not base it on scripture. I believe that a man cannot command his wife to do something that God does not require and that a woman can do everything that the scriptures teach. We cannot base our belief or obedience to God on the exceptions, the what-if's and the most convenient. People can find a hundred reasons to do exactly as the please, regardless of what GOd's word says. I dont believe a Christian husband can demand his wife get a job and furthermore, I dont believe a man who really reallly believes God's word, would demand that his wife go to work. As an older woman, I am not authorized to go beyond the scriptures and tell women that is "okay" if they go to work for various reasons. They will choose, themselves, but I will not teach anything outside of the scriptures myself, out of a respect for Titus 2 and 1st Timothy 5:14. It is obvious that many women do not follow these scriptures today, having proclaimed them outdated or not in keeping with the prevailing culture, but in the Lord's church, the women should be keeping closer to the scriptures. While many churches claim to have the truth regarding salvation, it is rather disappointing to see that they miss the parts that pertain to the conduct of men and women. In fact, even the most conservative church members will ignore the scriptures that pertain to the women. It is sad to see them going to work and dressing immodestly, when they can have such a great power and impact on the family by being dedicated to the home. A man has no scriptural authority to demand his wife do anything that God does not command. Regarding going to work: deal with the emergencies and the exceptions when they come, but if an older woman were to teach that there were a hundred exceptions, she would be nullifying the very thing she was teaching. Everyone has to decide to what degree they want to be homemakers, and hopefully the young women will develop a strong faith and reliance upon God's provision. We do know there are great rewards in following the scriptures and in obeying the commands of God. I suspect a lot of the controversy regarding work outside the home is a result of a focus upon money. Money rules, these days, in the lives of many. Money solves their problems, and supports a lot of bad habits. Money covers up and supports a lot of things that should be changed, but it is just easier to get money than it is to change one's life. Religious men and women often go on and on about obedience, yet I too notice they pick and choose. One example is when a husband will ask his wife to become a full time homemaker. Many women will obey when it comes to GOING to work, but will resist when it comes to QUITTING work. Jamie: It is good to follow his lead, but women can warn their husbands when they are headed in the wrong direction, especially regarding the family. As women are supposed to guard and guide the home, they have to discern what is right and wrong to do. When they understand that going to work is to divide their time and will cause a neglect of the family, they have to remind their husbands what God's word says. In Fascinating Womanhood classes, we were taught what the scriptures said regarding the different roles of men and women,a dn when a man asked a woman to go to work and do what HE should be doing, she was to remember those scriptures. I will say at the outset that no wife with children at home should be asked to work. Children need their mammas until they leave the nest and even beyond. Mothers and grandmothers need to be available to help their children, grandchildren, aged parents, etc., etc. A few Christian couples of my acquaintance (age 50s & 60s)have, for whatever reasons that are none of my business, decided TOGETHER, that the wives seek income. One lady provides private duty nursing care three mornings a week. Another lady teaches higher mathematics to homeschoolers while another very talented lady gives piano lessons in her home. These examples are a far cry from jobs that require ladies to go out into public places and work as waitresses, secretaries, nurse's aides, file clerks, etc., and be accountable to strangers. I can tell you from experience that these types of jobs are grim and not condusive to a happy home life. I guess I'm trying to say that I don't see a problem with older ladies without children in their care(or without children at all) doing occasional work for pay IF... she and her husband agree that such is necessary...as long as that work does not interfere with her home duties or place her in a situation that compromises her committments to God and to her husband. B) Women providing an occasional product or service to fellow Christians for pay. I hope this post doesn't seem crass. I'm just trying to point out that a lady giving piano lessons in her home for $25 a week is not dishonoring her God-given role as keeper of the home. I also hope that my spelling, grammar and punctuation are not completely off-base. To the women who said this is a difficult subject. And then gave examples and clarifications. Either you believe in Titus 2 and will obey God or you don't.Think of it this way you can't be a little pregant. You either are or you aren't. All the women I know who started doing work the way you talk about never stop there.The family becomes dependent on the money and it leads to more work for pay.The husband likes the "security" of her income and then faith in God to provide goes out the window. I agree that the kind of work makes a big difference. Women used to sell their eggs or the produce from their gardens, teach piano in their own living rooms, sell some of their baked goods, etc. My aunt, a farmers wife, sold home baked rolls to a restaurant in her nearby town. These things do not interfere or drag down home life, the way the jobs do today, with their rigid schedules and requirements. Women who go into those jobs, even as a temporary emergency, often never quit them, as they become so dependent upon them. When I married I was a full-time career woman and a new Christian. My husband wanted me to work, and I even supported both of us for a time while he started his own business. Fast forward twenty years. We've both grown in the Lord and are much more familiar with the scriptural view of the family. I'm now at home full-time, and even with just the two of us at home (no kids due to infertility), I cannot tell you how much better our lives run with me at home. Because I take care of things on the homefront, my husband is free to concentrate more fully on his business. I'm able to bring in a little extra money through freelance writing and editing and tutoring homeschool students in English (mostly because I enjoy it), but the majority of my financial contribution comes from saving us money by gardening, cooking, and taking care of our home. I say this to encourage wives to "look outside the box" and not assume too quickly that being at home full-time is out of the question. Sometimes a little creative thinking and a clear-eyed look at the realities of finance (gas to get to work, need for professional clothing, lunches out, etc.) can go a long way to tip the scales in favor of staying home. Thank you so much for taking the time to explain this. I did want to post something about being at home without children. Eventually, even those who have children will be home without them, when they get homes of their own. It is a matter of knowing the many things to do, and today, there are so many MORE rescources for home living than there were even 20 years ago. Sometimes neighborhoods could get awfully lonely for the woman at home, even with children, and if they did not have knowledge of the things you mentioned--especially gardening, house maintenance, including the care of the inside of the house. There are meals to be planned and shopping trips to be made where one must scout out the best deals. That is not always possible if your day is spent in someone else's business at work. HOme businesses work out as long as they dont take over your life. Maybe the Question in the title of the post should have been, "Is there a scriptural example of men putting their wives in the work place to be providers for the family?" The answer I am hoping to get is a yes or a no regarding whether or not the scriptures give him the authority to do so, especially since the New Testament shows several direct commands for women to be concerned about marriage, children, keeping the home, and paying attention to the things regarding the family. A husband should be doing what he can to make these things possible for his wife, rather than making them impossible. If he sends her to work outside the home, she will use up all her waking time working for someone else, rather than minding the things of the home. I am afraid a lot of people thought I was asking if a wife should obey her husband. That might be another subject to address, but this was not the subject here. The subject was whether or not it was scriptural for a Christian husband to insist that his wife also provide a living for the family. Whether or not she obeys it would be another subject. I was trying to narrow the question down to whether or not a husband was following scripture if he did insist that his wife work outside the home. Today's Daily Mail Online (UK newspaper) has an article entitled "The Disappearing Duchess: I'm going to be a housewife for now, says Kate." That made for rather interesting reading....and some of the comments, even more so! Something in me really hopes that such a public desire to tend to the home will be part of a larger, observable trend...here in the U.S. as well as Britain! Brenda, that is encouraging news. I know there will be huge pressure on her to "do" something, as they say here, which means "something besides homemaking and being a wife." I wonder who will support and encourage her in her life at home. May I suggest that you write a 'Post specifically for Kate'...that is, with prudence and subtlty, producing an article for Home Living that, if the Dutchess of Cambridge in a rare moment of quiet were searching the net for Christian resources supporting her decision would assure her that despite the hiddeus pressure the likes of Jermaine Greer et all will place upon her and the lampooning of the vicious, toxic tabloid media in the UK and around the world, that she is doing right, along with something that would help Will also, that he would be armed with evidence to support her. the academic filth in the UK and Aus malign Queen Elizabeth II as nothing but an 'ill educated housewife' little knowing that her father saw to it that she received a thorough education from the brightest political, diplomatic and theological minds of the era that focused upon international relations, statesmanship, politics, oratory, history, theology and so much more (in a way, QEII is the greatest ambassador for home education alive today). Just because she did not receive a piece of paper from a bricks and mortar institution - and the ignorant leftists who claim the royals do nothing - this is an utter lie!! They do much for the UK and the world that the tabloid leftist media choose not to report!!! Could you also establish a day upon which your household and readership could pray and fast for the Duke and Dutchess of Cambridge, that the Lord protects them from the wickedness of the enemy and his legions, that our heavenly father gives them support to stand strong for Christian truth in gender roles and home life regardless of the vile persecution they will doubtless endure, that god's truth will reign supreme, and the toxicity wrought by the elites of the builder and boomer generation would be consigned once and for all to the dustbin of history, never again to resurface, where it jolly well belongs!! May God pay those generations for their vile wickedness and destruction of all that is Godly, good and true!! Sarah Eliot, thank you for the suggestion. I am going to move on to another promised post soon. I do believe if a man will ask a woman to work (speaking of Christians only), he should not ask her to keep house. That would end up being a completely different arrangement than Titus 2 and other verses describe. If you all can see what a pattern it follows when the wife is home paying attention to the family and the house. After many years of it, she graduates into a teaching position, whereby she teaches the younger women what she knows. If she has not lived the life of a homemaker, she cannot take on this role. Also, a widow that has served the church, if she has no living relatives that can care for her, is qualified to be provided for by the church, IF she has been faithful to the principles of the NT and if she is over 65. There is a misunderstanding of this, I notice, when people want to know why churches are not caring for single mothers or young women who are either widows or have been abandoned. In the NT the only ones qualified to be cared for by the church were older women who were widows who had been in the church a long, long time and had no children living. Church aid was not for just anyone, but limited to that one category of older women who had the right qualifications. Here is the rest of the passage where it speaks of the widow, and where it instructs the younger women. Referring to a wife who follows a husband no matter what: In my community there is a woman in jail today because she was what is known as an "accessory" (what a funny take on that word, especially since Victorian women are commonly erroneously stereotyped as mere accessories ;-)---she was an accessory to her husband selling drugs, and was charged with child endangerment, since they had chilren in the home while the dealings were going on. She was apparently going along with or obeying her husband when she lost all four of her children and ended up homeless, as she could not go back to the house, which was locked by authorities. Ladies, always filter all decisions through the word of God and make sure that you are not violating it. Some people think if a husband threatens them with divorce, they should comply, but no marriage is so important that women should risk doing wrong. Our government certainly does not excuse it, and I dont see anywhere in scripture where God teaches that you'll not be condemned if you do something wrong, in the name of obedience. This belief has been spread by several religions but it is not supported by scripture. That is a profound point. There are some laws we must obey, and the government is chosen by God to bring punishment to the wicked and reward the good. If a person does not believe the Bible, they usually believe the law of the land, which often reflects Biblical principles. Queen Elizabeth II supports her new daughter-in-law; she said she spent the first two years at home with her husband when he was in the service and said they were two of the best years of her life. I do not work all year round, but the times I work outside the home are very harsh on me. I end up burning the candle at both ends, and right now, I am sick. My husband, who is retired, does a good job of keeping house, but it does seem rather backward to me. I feel this sets a bad example for our sons, none of which are very motivated, and I usually succumb to the temptation to overspend the money. I called out of work today, as I am just too under the weather to go in. You are right about starting off by doing minimal work outside the home, and then before you know it, you are an indentured servant. At my stage in life it just shouldn't be that way. Age is another thing to consider, plus years married. Sometimes people think homemakers should get jobs, but they are not thinking about your stamina or health. If you have a job that depends upon your relationship with customers and you constantly have to be talking, or if you have a job where you feel you are so exposed to the public that you grow tired of it, it can be very wearing. At home you have more privacy and can pick and choose who you will visit, where you will go, and when you will rest and for how long. No woman who has put in many years as a homemaker should be sent out to work. Her reward for such dedicated hard work in the home should be less pressure and putting time into the things she is interested in. I have noticed that colleges are calling out to women from 40 to 60, offerring computers and grants and rewards, plus a promise of future employment. It looks like they are recycling women back into the schools and the work place. They expect to have the stamina of a teen and never get tired. I wonder how they get anything done at home, and I think they must be under tremendous pressure. You may find this article of interest. Sadly, http://www.sydneyanglicans.net/ministry/evangelism/women_church_and_work/ is the rule rather than the exception concerning the way in which supposed Bible-believing churches in Australia are addressing this issue. Those who should know better are deliberately dancing around the true problem; that of Biblical disobedience!!!!!! Where is Titus 2 mentioned? where is Prov 31 mentioned? Where is 1 Pet 3 mentioned? Nowhere!! This supposedly bible believing church has already rolled over and conceded defeat to the errant culture of the world that surrounds it! Even the most seemingly supportive commenter for Christian women to heed God's word re Titus 2 mounts a flawed, spineless and incipid argument for fear of what could only be interpreted as negative retaliation from others, especially other Christian women. This denomination stands firmly on not ordaining women to ministry, it stands firmly against homosexuality. It stands firmly against euthenasia and abortion, but re the essential role of Christian women of all ages, be they married or otherwise to guide and guard the home (not to mention modesty etc) is ignored and actively countered. This is common among supposed bible believing churches at least here in Sydney. One junior minister who occasionally stood for the truth that I know was harshly condemned for such during his traineeship and labelled a bully and forceful. This is a great shame, because girls and young women are being raised to either ignore or deliberately misinterpret the call of the word of God to women of faith within the body of Christ regardless of denomination. the next generation of women, those who are little girls now, are being defrauded of the truth by ministers and parents alike. the world may have an excuse, but Christ's church has no excuse! In the mid -fifties my parents added an addition to the house. My father spent the next three years working his regular job(8 hours) plus an extra four hours a night five days a week to pay off my uncle.Needless to say when it was paid off, he did not continue working the second job for the money. He always said it was a disgrace for a women to have to work because their husbands didn't provide for them. It seems to me that a lot of men are willing to have their wives work two jobs (home, and outside work) but, they themselves are not. As far as Biblical examples of husbands having the right to override scripture and tell their wives to get a job, I just can't find it.It's pretty clear that if someone brings another gospel your not suppose to follow it. Namomi and Ruth were coming back to be taken care of by Ruth's family , not to get jobs. It's sad how the responsiblity of taking care of a women is not taken serious by her family. Very well said. I agree with you. Thanks for taking the time to comment. Everything you all have said is really encouraging and insightful--some things I had not considered. If you really want to obey the Bible, you have to be determined to do it no matter what the circumstances. There will always be rumours of financial disaster, but look at the women of the past, how they stayed on their farms and became Mama and Grandma to their families and were valued and loved and elevated for that fact. Today, women dont think they can be homemakers--they have to keep reasurring everyone that they work. Lady Lydia, I just wanted to let you know that this post is so amazingly timely. Second from the top of your blog on a day I needed it most! But I do have another problem. I hear a lot of people boasting that maintaining a house in cleanliness is something that can be done in less than an hour a day. This faces me with a dilemma: Either they're all lying, or I'm an incompetent, because it takes me hours to get things looking tidy (well, before it all gets undone again)--and that doesn't even count the scrubbing and the laundry and the million minor emergencies that happen in a house with three children. I have systems in place. I have a weekly cleaning schedule. I just can't get through it all in sixty minutes! Am I just not good at this? Or are these hour-a-day people probably telling tall tales? I can't speak for the people who are well organized enough to have everything done, but I can say you are not crazy. There is a problem with doing it and having the time and the stamina to do it. If you are getting meals, cleaning up afterwards, looking after small children or even pets, then doing laundry, putting it away, cleaning the bathroom, and doing a lot of this every day, there will be some things at one end of the house that do not get done. You are only one person. If you have children old enough to help, it cuts down on your work, but of course it takes extra time to teach them the right way to do it, and you may have to put up with the temporarily incovenience of not having it done as nice as you would like. I have a ladies Bible class in my home one morning each week, and though I try to get everything in order the night before, I am not always bursting with energy to do it and not always caught up in the first place. So I close the doors on rooms that are not cleaned up to my satisfaction, and put something in front of them like a basket or a box or chair, to prevent curious lurkers, and then at least I have a clean living room clean, where they will be, and the dining area where they will get their refreshments and tea afterwards. Would make an interesting post. Wow! 101 comments. You have hit a nerve! We must also ask ourselves what we are passing onto the next generation. Our oldest is 25 and unmarried. I was talking to her one day and told her that it would be so nice if she married someone who was out of school and had a job already so that she wouldn't have to go through the "poor" years. My daughter replied, "You did it mom...I know I can too." It blessed me to know that I set an example to her of staying home without money and that it gave her confidence. I do not think there is any other post with this many comments. There seems to be a combination of subjects here: one is the decision of the young royals for Kate being a homemaker, another is the importance of a man not going against God's commands for Christian wives to be keepers at home. The other thing not covered is the fact that husbands are supposed to love their wives sacrificially. In some cases, men will sacrifice the time of their wives at home, opting instead for another income. So if a man asks his wife to get a job, he's neglecting the direct command to him as a husband to be sacrificial and unselfish. I also have a 25 year old daughter, recently engaged. She is taking online classes in order to get the obligatory degree, plus working two jobs in order to save up for a house and her wedding. We and the groom's parents have already told her that we will pay for most of the wedding, but we wish they would scale it down, so that the money could go for the house. With the new rules requiring 20% down, they will have to come up with 30 thousand just to get into the cheapest house around here, at 150K. So she is putting all this pressure on herself, and sadly, her fiancee's mother, sister and sister in law all work and believe that this is the only way to live in the modern world, therefore the whole family expects my daughter to continue this pace indefinitely. She had initially purposed that she wouldn't have to work at all after marriage, then that changed to after the birth of a child, then that changed to, maybe just a night or two a week for pin money. I have decided to go right over all their heads and pray earnestly every day for her and her future. This is not what I want for her, and most importantly, not what the Lord wants for her. But these young people have to blame themselves though, for wanting so much, so quickly, in terms of possessions and lifestyle. I have noticed that when I go to the commissary, I can tell, even though they are dressed in civilian clothes, the enlisted people, the officers and the spouses of the military members. It is particularly easy to tell when it is the woman who has the military career because her husband often has scraggly hair, sloppy clothes and poor grooming. I think it is because when she has the "career" he doesn't have to try as hard, to look decent, to have a good job that depends on him looking decent, etc. I would bet this is true outside of the military as well. Men will, in record speed, abdicate any responsibility which you are willing to take up for them. Look at who is running the churches, and just about everything else; look at the women doing yard work, taking out the garbage and working "the career". Ladies, it seems that whatever we, in our compassion or need to feel important, try to "help out" with, soon becomes our responsibility, alone. As to the poster who mentioned some saying you can clean your home in one hour. You may be able to make a good bit of it presentable but not deeply clean. Lady Lydia had a post a while back that was so good about all the other things needing done in the home...like the scrap books and the deeper cleaning and the hosting others to meals and 25 or so other things. Add to that the mending and sewing and gardening and other crafts. Teaching children etc, No day is long enough! Yet totally rewarding! We all can only do what we can and hopefully we can get the most important done. I know today I was running all day! This is true. The more you take over a man's role as provider, the less he will try to do it wholly on his own. When the feminists persuaded so many women to give up their roles in the home, they caused them to lose their most important power, and to enslave themselves instead to the workplace alongside men. In return, men became weaker and more effeminate, and more of them are not wanting to bear any kind of burden, hardship or stress or work "by the sweat of their borw" for the women and children. On the other hand, women need to return to the home and control matters there so that the husband is not neglected. If they will do their work at home, men will do better in their work to provide for the family, and they will become stronger, more manly. I have followed these comments with interest. I want to say that although I am not of the Christian faith, I agree with the necessity of women being at home to care for their husbands and children. The collapse of the social system that supported full time homemakers and the resulting divorce, addictions, greed for material things and status, as well as the destruction of our children is reason enough to stick to your guns and STAY HOME! I speak from the vantage point of 40 years of marriage and family life while staying at home. My daughters have grown up to be excellent women of wholesome values and devotion to duty as well as sacrificial love for their families. It is not easy to fight the tide of feminism, and I found it hurtful to be the target of derision and disdain for my title of homemaker. However, the proof is in the pudding! And I have a wonderful marriage and a nice but not elaborate home as well as the respect and love of my husband, daughters and grandchildren. I commented at anon 8:44 a.m. Thank you for your blog. It is like a good vitamin. Hopefully, a majority of the people coming to your blog are open to learning. Personally, I believe that there are a whole lot of men that don't have a clue that they should not ask their wives to work. There likely many that don't even know those verses are in the Bible. While many read their Bibles, they don't read the whole of it. As a youth I used to love to read the book of Genesis, I loved the book of Isaiah, and I would read "parts" of the four gospels over and over and over. I was in my early twenties before I even realized there was a book of Proverbs and discovered Proverbs Chapter 31. I was much older when I finally came across a simple Bible reading plan, five Old Testament Chapters every day, Three New Testament Chapters every day, 5 Psalms and 1 Proverb. The Psalms ard Proverbs are read once each month. If you follow this you will read the Bible about twice a year, and for the average reader it requires less time than to watch a 30 minute television program. I have mentioned to some that the Bible says that wives should not work, and they look at me like I just made something up. And then for those that might be familiar with the verse they will throw in that was then, things are different today. We are what we eat, and if we feed on the whole of the Word of God especially here in America where Bibles are so readily and easily available we the believers could make a difference. Even Dollar Tree has Bibles. At the same time though, even if men don't those verses I do think inately they should know they should be taking care of their wife and family. I think this post is very good. Also I would like to mention that our husbands also have a lot of pressure when other husbands talk about what their wives are doing. I know men are always testing women to see if they are strong enough in their femininity to withstand the pressure to be masculinized. "Well, can't drive a standard well? I know a woman who drives a truck with more than 6 gears at my workplace." "Hey, my co-worker travels by herself long distances without her husband. SHe can do it, why not you?" "Why do you have to ask your husband? I am sure you have enough upstairs to figure it out yourself"
lug heavy machinery or boxes around. I am late at commenting, but I have been enjoying reading all the comments on this subject. I do not think it biblical that a Christian man ask his wife to work, however, I realize that like the commentor towards the end said-most men don't have the foggiest idea that their wives should be at home. People (and husbands) will look at you like you have two heads if you mention that a woman's place is at home. Preachers don't talk about it and to be frank people just don't read their Bibles like they used to. I wish I could find a church that supported wives being at home and the preacher taught people how to live their everyday lives. If more churches did this we would see some changes in our society. Preachers do not know they power they have to change an entire culture. Preachers have been under attack if they say anything about the woman's role of the home, and have been since the 1960's or earlier. They are accused of lacking compassion (isnt that always what the progressives claim?) for the single women or the working women. If they could just say, "I am obligated only to preach what is taught in the scriptures, and beyond that, I cannot give approval," they would establish the Bible as the authority. True, most men have no clue that women are supposed to be home, and if they had mothers that worked outside the home, they find it unusual. The country women though, will probably lead the way in getting women back home. If you are a country wife, there is really nowhere to go that is close by, to work, and gas is so high, it just does not make sense to drive back and for to the city to work, therefore, they find it easier and better to stay home and let their husbands become the providers. Many people are sold on the belief that no one can survive on "one income," which has become kind of a by-word phrase these days. What it really means is: "one person getting a wage from a place of employment." If they only knew that there are always several sources of "income" when the wife is home, in the form of wise management, and careful regulation of the utilities of the house and the expenses of running a home. They are not counting the monetary gifts that families receive from relatives and friends, nor are they counting the sale of things or the saving of money and the careful use of family posessions. No one has only "one" income, but many families have one financial provider who works outside the home or from the home. If a woman tells someone she is at home, and her husband provides enough for the family, people are aghast wondering how she can survive on "one" income. But, what if that income is a large income? When it comes to the world's opinion, it is really not about the size of the one income, it is about getting women to leave their homes. My husband came home Friday night, and told me to "dust off my resume and start job hunting" because his boss had lost his job and he "might be the one looking after the children this summer" while I became the breadwinner because his job was at risk,too. When I asked him what kind of severance package his boss received (thinking this would give me an idea of what my husband could expect if he too were laid off), he told me that his boss had actually moved to another management position in the same company. In other words, he was trying to scare me into the workforce with the fear of financial ruin for our family if I didn't immediately get a job. This same scenario has played out multiple times during our marriage. In the beginning, I panicked and got a full-time position within a week. Once we had children, I knew I belonged at home. I have learned to stay calm, and tell him that we will be fine--our family has survived several periods of unemployment without my working outside the home and we can survive again. It isn't what he wants to hear, but it is the best option for our family. I know it would be almost impossible for me to return home if I began working again. I am one of those wives who has been threatened with divorce if I don't immediately return to work. The last time, my husband set a deadline, "You have until January 1st, 2010 to get a career or we will go to a lawyer and get a divorce. I'd like to see you live on $800 a month child support." I didn't get a job and he didn't move out, but that was the hardest three months of our marriage. I was so scared that my kids would lose their dad because I was being "selfish" by being a homemaker. God and the support of my mother, mother-in-law, and pastor got me through it. I know my work as a wife and mother is important, and I keep hoping that God will soften my husband's heart so he no longer feels the need to put such pressure on me to work full-time. Thank you for sharing your experience. Wives are supposed to be help-meets, and in doing the things that the scriptures have already laid out for her to do, (and as I explained, these instructions were for people who had become members of the Lord's body), she really does help out. For one thing, she helps him live his duty and his role better, as a provider for his own. She helps him obey the commands God has given to husbands, if she does her part at home. Ladies, do not tremble with fear when there is a threat of divorce, because often times men who do not know what the BIble teaches about women will assume that he can do as he pleases, without question. That is not what the scriptures teach. He is to be in obedience to God and no command can violate the Word. Sadly, a few husbands are not informed of the Bible's teachings. What is interesting to me is that you rarely hear of a man commanding his wife to relax, be a homemaker, and not worry about money because he will take care of his own. Most of the time the command is to go to work because he has lost confidence in finding an income. Yet, if you will wait it out and continue to mind your own business at home, things usually work themselves out. If you go to work, your husband not feel an urgent need to get work right away, and may take his time, and eventually he expects the wife to work all the time. To anon at 4:51pm, my heart goes out to you for the treatment you have recieved from your husband, I can't imagine dealing with a threat of divorce with a deadline attached to it. You are doing the right thing by staying at home--I wonder if your husband is a Christian?? My prayers are with you. Ladies I just want to remind everyone to be calm when there is a suggestion that you leave the children or the home and get a job. If you will read "When Queens Ride By" you'll see that the stranger who spoke with the farm lady said that her husband wanted her to go to work but she told him there was no use both of them being under stress, and that she would stay home and take care of his needs. Later on, he thanked her for doing that. I am so very sorry you have to go through such stress.You are not alone, please know that. There are some of us here too who have had to deal with such things... I know this will not make your situation any better for you and I am not trying to make light of it. Please just hang on and I am glad you have had your some people on your side. Feminism as I mentioned earlier has made things harder for good women. Please know that God will see you through..pray,pray like never before each time such threats come. God will hold you. The men test us and will test us severely .. when we hold up with grace , they will secretly be thankful but may not say so. It is when we hold strong on the inside and yet present a soft exterior, that we will be able to persevere. Without faithful wives and mothers, our country will not long survive . Please take heart and don't give up. To answer the question: Should a Christian man send his wife to work? - No, it violates scripture and is not in line with the duty that is given him by God to be sacrificial towards his wife and to "provide for his own," another command to the man. No example is shown of a man sending his wife to earn a living, nor is there a command for him to command his wife to get a job. Some people say Proverbs 31 describes a wife as someone who has a job, is a real estate agent, and is constantly earning money, but if they will read it carefully they will see that she sewed things for the merchant to sell in the marketplace. She did not go out and sell it herself. She gave it to the merchant. Also, in considering a field and buying it, she may have done it once, and bought it for a garden, but it does not mean sold real estate. It is common even today for women to buy property or to sell their home and buy another one, but it doesn't put them in real estate business all the time. No, a Christian man should not demand his wife earn money nor threaten divorce if she does not. He is not authorized to do either. He is authorized to be the head of the wife but only in the framework of scripture command and example. You dear ladies might be interested in a blog entry by Leila at "Like Mother, Like Daughter" posted Wed May 4, 2011 titled, "Ask Auntie Leila: I feel guilty not working!" please give us the blog link address. You posted the complete chapter of Titus 2 and I noticed the words, "sound speech, which cannot be condemned." Christians are supposed to speak as though they are reflecting the speech of God ("Speak as the oracles of God"). Sound speech is based on truth and the authority of scriptures. If a man tells his wife to get a job, it is not sound speech. Of interest, the www.sydneyanglicans.org website has run two additional articles on the role of women subsequent to my comment upon your blog. in some aspects partially preach the Truth on Titus 2 and Proverbs 31, however they still refuse to present God's directive for Christian women everywhere adequately. I believe it is telling that nobody has summoned up the nerve to comment upon either article - afraid of the feminists, I suspect. I would be very interested in your thoughts and feedback concerning the Sydney Anglican perspective, as it is one mirrored across the entire denominational spectrum. Blog readers, also feel free to take a look, especially readers from Australia, and Sydney. Of recent times to avoid stereotyping our daughters into domesticity, educationalists have joined the rhetorical calls: “Biology is not destiny”; “You can do whatever you want and be whoever you wish”; “You can have a career and a family and fun and whatever you wish”; “The glass ceiling is only there to be broken.” But rhetoric is not reality. Education should have a truth factor in it. The rhetoric of social change is a dangerous element in compulsory education. Biology is not destiny but biology does delimit destiny. My desire to be an elite athlete will be tempered by my inadequate biology. My desire to change my career path into a more physically challenging activity will be tempered by my age. And when it comes to women, the biology of reproduction has some fairly strong limits. Sylvia Ann Hewlett’s book Creating a Life: Professional Women and the Quest for children” recounts the terrible consequences of the ‘education’ that women received in the last generation. For those who wish a career without a family the progress has been difficult but straightforward. But for those who put childbearing on hold while they pursued their career, the desire for motherhood has been largely disappointed. Her book, based on extensive statistical research and in depth interviews, is a heart-felt plea for young women to be “much more intentional about their private lives”, specifically about marriage and childbearing. To educate young women with the ideal of changing the world or finding fulfilment or fulfilling their potential by their career while at the same time to be a wife and mother is as unrealistic as it is harmful. A few women of enormous abilities can manage incredible responsibilities simultaneously – but they are not average or normal. They may be people we can admire, congratulate and wish success but they are hardly role models for the rest of us. Even our Governor-General, who has demonstrated just how far a wife and mother of five and grandmother of eight can go in our society, advises that you can have family and a career, just not at the same time. Biology would tell you which must come first, but the rhetoric of our social engineers inhibits the speaking this truth – it is politically incorrect to mention it. And such advice is not limited to women. A friend, training to be a surgeon, informed me of a common saying amongst his peers “You can’t have a wife and a knife”. The hours he was keeping and the pressure under which he was working and studying as a registrar made marriage almost impossible. Those he saw ignoring this maxim either struggled with their career or with their marriage. Motherhood is a hard choice for women in a society where career is King – or should I say Queen. You can make a career out of early childhood care and education but not out of caring and educating your own children. The same task with pay is desirable – but without payment, and without the status of “career”, it is denigrated. However, a salary does not dignify labour. To work for your own children without pay is no less work, or contribution to society, or valuable in God’s sight. Our value lies not in what society thinks or how much it pays but in our creation in the image of God, to fill the earth and subdue it, (Genesis 1:26-28) and in our recreation into the image of his Son (Romans 8:29, 1 Corinthians 11:1, Philippians 2:5-11, Colossians 3:10). There can be few tasks more Christ like than giving up ourselves to care for little children (Mark 10:14). This week has seen the discussion about increasing the participation rate of women in the workforce. The particular emphasis has been on increasing the number of mothers returning to the workforce and the speed at which they return after having given birth. Because we do not put an economic value on ‘stay at home mothers’ the assumption is that mothers should return to the workforce whenever the inevitable economic arguments are presented. One commentator, responding to the comment that mothers may choose not to return to the workforce said ‘our intention is not that all women be forced back to work, but that they have the choice to return to work if they wish’. I was glad when I heard this comment, as it recognized that many people are willing to accept a lower standard of living with fewer toys in exchange for the privilege of being at home with the family. But then I thought more about it, and realised that choice for some takes choice away from others. The most expensive part of family life is housing. The price of housing, both for rental and for purchase is set by what the market is willing to pay. If we have more families on two incomes, then more families will be able to pay more for housing. This pushes up the price of housing. Some years ago I charted female participation rate in the workforce against housing rental costs. While I know there are other significant factors, it was very illuminating to observe that rents followed participation rate, only lagging by about a year. That this happens is good news for landlords and home sellers but it takes away choice from others. If rents rise, it makes it harder for families to survive on one income; so the opportunity to choose to stay at home is diminished, and economics again triumphs. When we read and listen to the ‘spin’ that comes with public policy, we need to keep asking in what ways does this change affect our choices in living the life of faith? Sarah Eliot in Australia: this is just terrible: "biology is not destiny"--well we know what they mean by that! It means they believe that a female does not necesarily need to be a wife and mother and keeper at home, and a man does not really have to be a breadwinner or provider or a sacrificial leader like Christ. Thank you everyone for your wise replies on this subject. It is odd to me that Christian leaders, preachers, etc. will preach that a woman should go to work. It is like they have not read the Bible at all and are just catering to the times. There will always be a financial crisis in our country, according to the gloom and doom press. Those reports are designed to make men fear that they cannot support their families or that they will lose their houses. If women will be calm and carry on as wives, mothers and home keepers, they will find it will not come to the disaster that is predicted. Do what is commanded in scripture, and see if the Lord will pour out a blessing that is greater than you can hold. Obey the Lord and fear the Lord first, at whatever the cost and you will find his protection is there and you will prosper. This is about faith, not about money. It is about living your faith and being an example of the faith. Faith is something that unbelievers cannot understand. They only understand figures and money that adds up. They dont understand the connection between obedience to the word of God and success in life . We should not expect wordly friends and relatives to understand. In fact the Bible says they are astonished that we do not run with them--meaning follow the crowd. the econonic forcast is about money and Christians always need to first think, "What is God's law? What should I follow?" People are always trying to put a monetary value on everything, but a couple can live and be happy without worrying all the time. The Provergs 31 woman "laughs at the time to come"--meaning she is not worried. We should not worry, as the Bible says not to be anxious about anything. Yet Christian men and women constantly worry about money. You can't worry and have faith at the same time. Thank you so much for your input re the Sydney Anglican take on all of this (many thanks also to comment contributions). Lydia, your thoughts as expressed in this statement 'This is about faith, not about money. ' strike at what is truly wrong with the Evangelical (with few exceptions) approach to the Word of God. they stand firm almost to the point of fanaticism on two or three key issues (sexuality, gender & the ministry, Right to Life) with the argument that they are upholding the Word of God (sydney Anglicans pride themselves - there; a problem already - on faithfulness to Scripture) whilst conveniently ignoring this self same Word of God when it comes to homekeeping. the Sydang view of itself as one informed by faith over spin, yet in the two articles, the world and the 'times' are catered to, rather than said authors proclaiming the straight truth. they claim it is about faith, not money, yet buried in the subtext lies the truth - that indeed, money is being catered to with faith a distant second. This is a microchasm of Western Evangelical Christianity almost without exception despite denominational affiliation. As a woman, I find myself feeling betrayed by those entrusted with the duty of preaching the Word of God seeming to please itching ears rather than delivering with fidelity Christ's sober call to His people. Its one thing for the world not to give two hoots about biblical instruction (same goes for the liberal, heretical strand of so called Christianity) It is another thing altogether for the supposed champions of Biblical Truth and Christ-centred salvation in Sydney - and reaching out to regional and interstate communities via church plantings and mission work - to deliberately water down God's clear instruction re our role as women...the very stability and strength of the Body of Christ is at stake here, I believe. Any Sydney Anglicans reading this, plus other Australians (regardless of denomination), buck the trend and trust God. PS: What do you think of the appearance of John Piper's wife here in aus at the 'Oxygen' conference in august this year to not only encourage pastors' wives but also women in full time ministry?Thought the Pipers were straight up and down re this type of thing. Audrey Broggi wrote an article called "This Women in Ministry Thing". It sums up the lack of value that is placed on the home. Thank you for this post! It was just the encouragement I've needed this week. See, it's not my husband requiring (or requesting) that I go back to work- it's my mother who has gone through two failed marriages and doesn't want to see me as she is now, old and alone and career-less. I must admit, seeing her struggles and feeling insecure in my marriage has made me want to go back to school so that I can be prepared for the day when I am no longer married. My husband has just told me this evening that he wants me to stay at home so that I can (go back to) homeschool because he thinks it is important. I am going to continue my education online, not as a back-up plan, but because I enjoy doing it and it helps my family financially because I am a veteran. I feel good about not leaving my family behind for my career, but still being able to contribute to our struggling finances. Am I doing the right thing or is even this too much of a compromise? It is good you are home and not being pressured to get another job. Homemaking IS a job, and if God's plan is sufficient, superior and truthful, then why do women spend so much time worrying about back-up plans? Have you considered how much you are taking on, in pursuing even an online education? HOw much time and energy does a woman have? If you have children, you will not regret that you gave your time to them, and to getting your rest. Do you know the pressure it may bring to your life if you sign up for courses? Don't sign on the dotted line or agree to grants and loans or make a commitment until you have counted the true cost in time and in the loss of YOU in your children's lives. You may think you have time in the evenings, but you will find that you are tired the next day and unable to give your home the attention it needs. Consider the cost other than the financial cost. The Aust. Federal government handed down the national budget for the next 12 months last night. Previously, breadwinners have been able to claim a tax offset if their spouse has been a homemaker (not in the workforce). the Australian Labor Govt. (the equivalent of the US Democrats) has repealed this for all single income households in which the dependant spouse is under 40. Gillard seeks to turn this nation into one giant marxist collective!! aussie homemakers, stand your ground and to heck with the govt. 's lousy tax-break...We can do it without them!! I believe Australia is the international testlab in many ways for the implimentation of a wide range of govt. inspired social reordering. Its time we the 'lab-rats' fought back! Christian women, withdraw your labour and show this sorry god-rejecting nation the true beauty of our highest calling!! I was recently in the home of a family whose oldest child, a 21-yr old son, is a drug addict. The parents are a two-income family and have been able to provide a gorgeous home with pool, weight room, the latest entertainment systems, and cars for their kids. The oldest son has bewildered the parents by stating (in therapy) that he never thought his parents loved him because it was so easy to "get over" on them whenever he wanted something. His mom would give in the minute he started throwing a fit, he said. Could it be possible to enjoy living in that huge, lovely home knowing your child is living in his second rehab facility? I couldn't. I know this doesn't happen in every two-income family, but can you just be too tired from a job to say no and stick to it? I just wanted you to know that I linked to this post on my blog post today. Thanks for the blessed homemaking blog tip. The article goes right along with this post and when I have time I will include a link to it within the post. Mrs. A.,(dear cousin) Thank you. I will try to write you soon. Mrs. Eliot in Australia, your prime minister seems on one hand to be going back to the old paths, for example, her statements on putting phonetics back into the schools, and on the other hand she wants women all working outside the home and no tax breaks for the men who are supporting their wives. Still, no one HAS to use money or tax deductions as a reason to send their wives to work. Ultimately, God gives the reward to those who follow His will. One scripture says "Work with your hands as unto the Lord, and not unto men, for ye serve the Lord God and it is from Him you receive the reward." We have to quit looking at government as our Lord. Those who follow scripture as their law will eventually bring great benefits to the government, as it makes better citizens and a better country when we follow our Lord and His Law. Regarding school online and the acquirement of a degree. As ll said previously, why are we saying God's word is the ultimate and then getting a degree "to fall back on." The greatest thing you can do is mind your home and raise your family and be stable at home. Degrees are for making money, mainly, and any knowledge you need can be aquired in a host of ways. A degree will put you in temptation to get a job.When you have a degree, there will be pressure on you to use it. Degrees give women a false sense of security. There is nothing in the Bible that commands a woman to get one, and there is nothing that indicates she should be the provider. She provides in many ways by guarding her husband's money and making sure other people don't swindle him out of it! Ladies it will be the Christian women who lead the culture and the church in restoring the role of women in the home and men at work. It will be the women who will help the men become the men they are supposed to be, partly just by not taking over their role! It is sad to see some of our leading political leaders and royal families splitting up, so it will also be the homemakers who will lead the way in having stable marriages. You cannot use the leaders of this world as role models for marriage, home and family, unless they are following the Bible. You, the homemakers of this world, are really the leaders. yes, as more individuals and families obey the word of God fully, this will permiate into the society which will in turn influence the civic sphere and public policy. Let us pray for the latter rain of the Holy Spirit to fall upon our land and re-invigorate a virtually dead Christianity in the West. No, Husbands should not ask their wives to go to work. God has also plainly said, my people perish for a lack of knowledge. Like many I have learned, and relearned much on the internet. If we who know that wives should not be working would share more of the scriptures on this subject, ..perhaps we could just say, "I printed off an interesting posting you might enjoy" we could affect a change. Perhaps we will only influence one. And if that one influeces one, it would grow monmoumentally. And, we can pray that the eyes of understanding of all husbands would be opened. And we can pray for the prosperity of our husbands, and speak the prosperity scriptures over them often. We can pray for our neighbors that they grow in grace. Prayer does change things when we pray and not just agree with the bumper sticker quote. Side note: Mrs Lydia, have you done a posting on setting up a desk?